I'm a book launch specialist who helps authors bring their book(s) to the world through marketing and social media. In today’s rapidly changing book marketplace, more and more is being demanded of authors. Whether you have a contract with a traditional publisher or you are going the self-publishing route, you can’t rely on anyone else to promote your book. Today’s author must be one part writer and one part marketer, but most people don’t have the time or expertise to pull it off. That’s where I come in. I offer boutique book launch marketing and social media services. I can help you to meet all the demands placed on the modern author. Through full service support or consultation, I can help you to navigate the book launch process and reach the readers you want to read your book(s)! I'll review your current author platform, visions, and goals and then come up with a plan to set you on your way for success. This will include, a social media plan, an "outreach strategy" to reach endorsers and influencers, a media/PR plan, and much more. This consultation includes an initial 30 minute call where I will interview you and a follow up 60-minute call for us to walk you through your plan. These days, everyone knows that they need a good social media presence to find their "tribe," but few know how to do it. 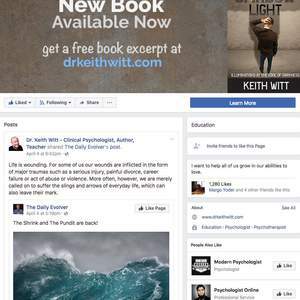 I've run many successful Facebook campaigns for authors that built significant audiences for their work. My services include: daily content posting, setting up and running a variety of Facebook ad campaigns, connecting your Facebook audience to your website/email list, running Facebook Live video series, and more. If you're looking for more "hands on" support, we can run your campaign for you. This includes everything from conceiving of your core messaging and marketing copy, to developing and implementing an outreach plan, to getting you media exposure, launching your social media profile and more! I offer shorter 3-month "launch packages" where I put together everything you need and then train you to keep the fires burning as your campaign evolves. For bigger projects, I also offer more extensive 6-12 months campaigns. Inquire for details. To work with me, send a message through Reedsy and tell me a little about what you're looking for. I'll get back to you ASAP! As a "book launch specialist," I focus on helping thought leaders and authors to build thriving online platforms for their work and their books, including social media campaigns and marketing strategy. I've worked on small self-published books from first time authors all the way up to New York Times bestseller campaigns for serial authors. . . and everything in between. I'm currently developing several TV and film projects with my small film company called Time Future Films. I was responsible for developing and overseeing publicity and media campaigns to build and spread awareness of our brand. In my role I successfully oversaw the launch of a bestselling book by our founder, managed the design and implementation of a new web infrastructure, and built a thriving content marketing business. In 2006, I co-founded an online thought-leadership-building business called "ThoughtLead." We consulted with various leading-edge thinkers to build thriving online platforms based on their body of work. In the fall of 2017, I managed the launch of Evolutionary Relationships: Unleashing the Power of Mutual Awakening by Patricia Albere (Oracle Press, 2017). We tapped into the author's grassroots network of fans and practitioners to organize a nation-wide book tour and Amazon bestseller campaign. As a result, the book achieved Overall Bestseller status on Amazon, and Top 10 in its category (Spirituality & Religion). In January 2016, I managed the launch of Executive Coach John Mattone's latest book, Cultural Transformations: Lessons of Leadership and Corporate Reinvention. The campaign was multi-dimensional, including an extensive online marketing campaign, PR & Media, Social Media, and selling large quantities of the book to corporations and leadership/management organizations. As a result, the book became both a CEO Read and Amazon Bestseller. I acted as the primary consultant to the bestseller campaign for Alan Fox's book, People Tools: 54 Strategies for Building Relationships, Creating Joy, and Embracing Prosperity (SelectBooks 2014). In that capacity, I gave strategic advice for how to best leverage sales/marketing efforts in order to get the book on a variety of bestseller lists. I also wrote marketing and web copy, and helped develop partnership outreach strategies. As a result, People Tools made it onto the following bestseller lists: New York Times (#7), Amazon (#1), Publisher's Weekly (#5), Barnes & Noble (#5), and USA Today. I served in the same capacity for the two follow up books in the series, People Tools for Business and People Tools for Love & Relationships, which also reached a variety of bestseller lists (NY Times Business, CEO Read, LA Times, and Publisher's Weekly). The Clarity Compass: See More Clearly. Have Creative Conversations. Live the Life you Want. Making email fun for over a decade. Join Reedsy to request a free quote from Joel and over 1,000 similar profiles.